HELP IN INTERPRETING TEST DATA? When reinforced concrete structures are exposed to extreme environmental conditions they deteriorate at an alarming rate. Therefore, repair and rehabilitation costs of structures far exceed the total budget for capital development programmes. The issue with most structures is not if maintenance is required, but when and where to schedule it most cost- effectively. Therefore, in order to maintain the serviceability of concrete structures it is essential to monitor the performance of structures continuously at three different stages during their service life, viz. initial stage where material properties of concrete change, second and crucial stage where deterioration is initiated and third stage where propagation of deterioration takes place. Smart structures – structures incorporating in their design sensor elements and actuating devices which not only diagnose a problem but affect a solution to the problem – are a new approach for the diagnosis of faults and incipient failures and enable scheduling maintenance effort most effectively and at optimum cost, minimising the possibility of catastrophic failure. Septopod can be installed in structures at the time of their construction or a miniature version can be retrofitted. Therefore, the structural health monitoring can be carried out continuously. 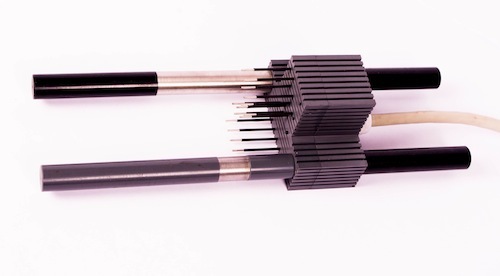 The Septopod sensor comprises an integration of different sensor techniques engineered into a compact design that can be easily embedded in the cover zone of reinforced concrete. 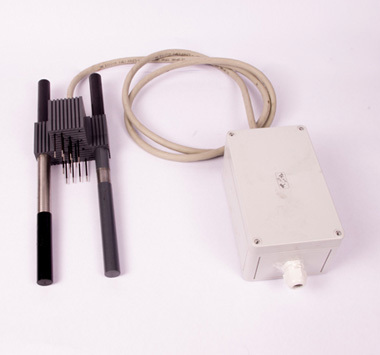 The sensor unit consists of 2-pin electrode array to monitor the ingress of moisture and/or chloride front in the cover zone of concrete, thermistors for monitoring the temperature variations along depth in the cover concrete, 4-pin electrodes for measuring the resistivity of concrete and the support structure of the sensor unit consists of mild steel anode – stainless steel cathode arrangement for measuring the corrosion current (Figure 1 below). The unique combinations of different sensor techniques complements each other and form part of an integrated monitoring system to provide the long term performance of reinforced concrete structures from the time concrete is poured. Therefore, any defect in concrete or its performance is identified well before concrete sets, which is continually monitored as the user prefers. 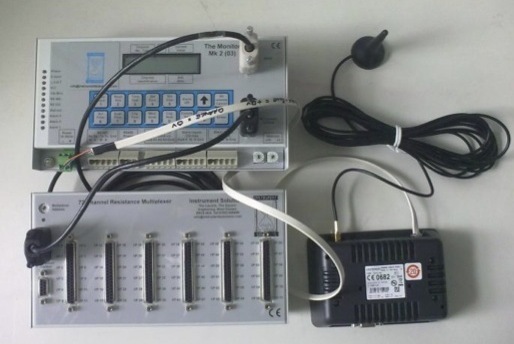 • DATA LOGGER: High performance and easy to use data acquisition system (Fig. 2a) that operates with 10- 30V DC power supply with a 2-line LCD display to indicate logger status. It can be connected to a PC using a RS232 or USB connection. Alternatively a modem can be used for remote operation. • MULTIPLEXER: The multiplexer (Fig. 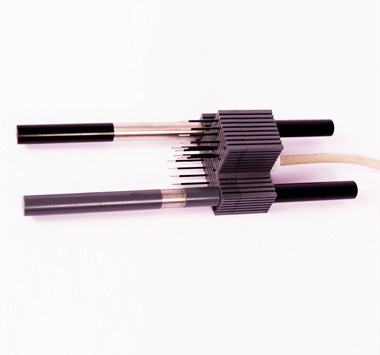 2b) is connected to the main data logger and is capable of interfacing with 6 Septopod sensor probes simultaneously. The multiplexers can be connected to the mail logger in series with each multiplexer set to a unique address. • WI-FI MODEM: The wireless GSM modem allows simple wireless connection to a PC based TCP/IP network, or to a GSM modem for remote data downloading. This enables global data access and retrieval as well as complete control of the Logger (Fig. 2a). • PC Software: The comprehensive software supplied with the monitoring system allows configuring the logger along with multiplexer and Wi-Fi modem. The easy to use Resist software allows download, view and export the data to MS Excel format. SEPTOPOD sensor provides long-term information on the performance of cover zone of concrete without causing damage. Its unique combination of sensors enables the monitoring of corrosion activity, electrical resistivity or conductivity, moisture and temperature changes in the cover-zone of reinforced concrete structures. SEPTOPOD can monitor changes in cover concrete as well as reinforcement. This paper details the application of in situ electrical measurements to study cover-zone performance and presents the initial results from a long-term field exposure study. 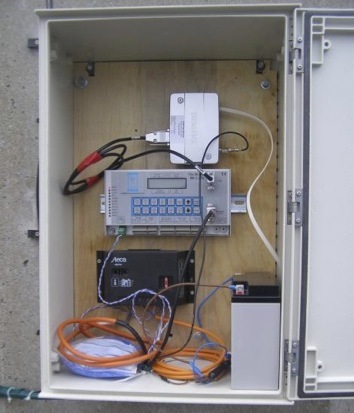 Field data are presented from a marine test site, an urban exposure site and a roadside test site. A range of formalisms are exploited to allow ease in data interpretation and a simple electrical model is used to show the interrelationship between electrical properties of concrete, pore structure, degree of pore saturation and ionic ingress. Measurements, to date, indicate that the sensor arrangement embedded within each of the test specimens is behaving as anticipated from previous laboratory studies.Water absorption, ongoing hydration and pozzolanic activity are detected within the cover zone and, in the case of the marine site, ionic ingress is detected in one of the sets of test specimens. McCarter, W. J., Butler, A., Chrisp, T. M., Emerson, M., Starrs, G., & Blewett, J. (2001). Field trials on covercrete monitoring sensors. Proceedings of the Institution of Civil Engineers. Structures and buildings, 146(3), 295-305. This paper presents a new marine exposure site being developed on the North-west Atlantic coastline of Ireland in Co. Donegal by the Centre for Built Environment Research at Queen’s University Belfast. The site will initially contain a number of large precast concrete stems, each 1.5m high, 1.5m wide and 1m thick placed on concrete plinths poured in-situ. The concrete stems will be placed at three levels to achieve different exposure conditions outlined in EN 206, namely atmospheric (XS1), a splash or spray zone (XS3) and a tidal zone (XS3) where the stems will be submerged by the incoming tide twice daily. The concrete will consist of different cements and appropriate w/b ratios suitable for this type of exposure. 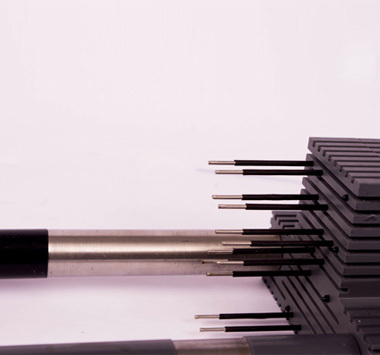 The permeability and diffusion properties will be measured using non-destructive tests developed at Queen’s University Belfast, namely the Autoclam permeability system and the Permit ion migration test. Other tests to measure the corrosion of the embedded rebar will also be undertaken. In order to monitor the internal concrete properties, electrical sensors will be attached to the rebar and embedded in concrete. The information from these sensors will be relayed back to the office using remote wireless technology. Such integrated monitoring systems for concrete structures can reduce assessment and repair costs by continuously profiling the covercrete and corrosion for the ingress of various deleterious substances, such as chlorides, in the reinforcing steel in real-time. This approach permits an informed assessment of the performance of the structure throughout its service life. This site will form part of a world-wide exposure study, including similar sites in Scotland, India and China. ACMs outperformed the control concrete made with ordinary Portland cement (OPC). Drilled dust samples extracted after different durations of ponding were tested for the chloride content, which confirmed that the increase in resistance of the ACMs was due to the combined effects of the reduction in the penetration of chlorides and the continuous hydration activity of the ACMs. 2.3 Electrical Based Sensors and Remote Monitoring System for Assessing the Corrosion Related Activity in Concrete at Hangzhou Bay Bridge. Concrete structures in marine environments are subjected to cyclic wetting and drying, corrosion of reinforcement due to chloride ingress and biological deterioration. In order to assess the quality of concrete and predict the corrosion activity of reinforcing steel in concrete in this environment, it is essential to monitor the concrete continuously right from the construction phase to the end of service life of the structure. In this paper a novel combination of sensor techniques which are integrated in a sensor probe is used to monitor the quality of cover concrete and corrosion of the reinforcement. The integrated sensor probe was embedded in different concrete samples exposed to an aggressive marine environment at the Hangzhou Bay Bridge in China. The sensor probes were connected to a monitoring station, which enabled the access and control of the data remotely from Belfast, UK. The initial data obtained from the monitoring station reflected the early age properties of the concretes and distinct variations in these properties were observed with different concrete types. Srinivasan, S., Basheer, M., Mao, J., Jin, W.-L., McCarter, W.J. & Li, K. (2012). Electrical Based Sensors and Remote Monitoring System for Assessing the Corrosion Related Activity in Concrete at Hangzhou Bay Bridge. Paper presented at Workshop on Civil Structural Health Monitoring (CSHM-4), Berlin, Germany, 06/11/2012 - 08/11/2012, pp. 1-12.